The UK was misled over former Iraqi dictator Saddam Hussein's access to weapons of mass destruction, former Prime Minister Gordon Brown has said. Mr Brown says US intelligence, which challenged the extent of Iraq's WMD stockpile, was not shared with the UK before it joined the Iraq War. In an extract from his memoir, the ex-Labour leader says "we were not just misinformed, but misled". Mr Brown says he became aware of the "crucial" paper after leaving office. The Iraq War - which divided British public opinion - began in March 2003, with the conflict and its aftermath claiming the lives of 179 UK troops. The UK joined the US-led invasion after both countries jointly accused Saddam Hussein of possessing weapons of mass destruction and having links to terrorism. British intelligence from 2002, seen at the time by the then-Prime Minister Tony Blair and Mr Brown, suggested the country was capable of having such weapons. "I was told they knew where the weapons were," Mr Brown writes. "I remember thinking at the time that it was almost as if they could give me the street name and number where they were located." But, Mr Brown says a report commissioned at the time by the then-US Defence Secretary Donald Rumsfeld "forcibly challenged" this view. He said it suggested other intelligence had relied "heavily on analytic assumptions" rather than hard evidence, and disproved Iraq's capability to make weapons of mass destruction. "If I am right that somewhere within the American system the truth about Iraq's lack of weapons was known, then we were not just misinformed but misled on the critical issue," he writes in My Life, Our Times. A seven-year inquiry into the UK's involvement in the Iraq War found Saddam Hussein posed "no imminent threat" when the US and UK invaded. The Chilcot report also concluded that "flawed" intelligence started the war. 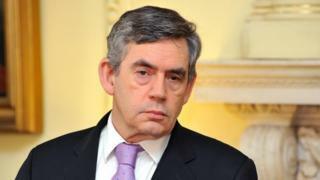 According to Mr Brown, the UK may never have agreed to take part if the information had been shared. "Given that Iraq had no usable chemical, biological or nuclear weapons that it could deploy and was not about to attack the coalition, then two tests of a just war were not met: war could not be justified." Despite this, he did say some action was required due to the failure of Saddam Hussein complying with UN resolutions.